In 1942, Captain Chandler's plane explodes on a bombing run in the South Pacific. In Manhattan of the near future, the time traveling Nazi air force is bombing the city. Miss Fury listens as Schauberger explains what has been going on. Harmon is really Hermann, a Nazi spy, who was a rival of Schauberger's. When Hermann killed Schauburger, and then Miss Fury fell through the skylight into the time machine, their paths through time were linked. He hands her a strange ball and tells her to travel through time and kill Hermann. Schauberger tells Fury to shoot down the planes coming at them, but she refuses. She's had enough killing, and enough of people controlling her. Schauberger rages at her, telling her that Hermann rigged Chandler's plane to blow up, and Miss Fury then takes control of her time traveling and sends herself back to 1943. There, she confronts Hermann, and says she won't kill again... after this. Then she shoots him, and destroys the crown and the time machine that started it all. Finally she travels back to 1942, to the train platform, so she can see Chandler again. But he's not there. And Schauberger, watching from the side, leers at her confusion and travels in time once more. 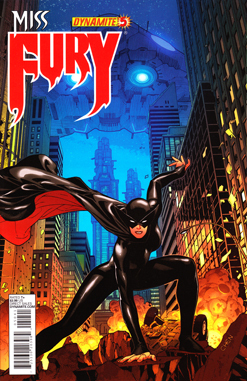 This is an excellent continuation (not quite a conclusion yet) of the first Miss Fury story arc. The confusing elements finally get explained, and we learn what is really going on. When Miss Fury fell through the skylight in issue 1 and entered the time machine, she was the first person to use it. She became, in Schauberger's words, the "original" time traveler. This makes her special. Later she is able to travel just by wishing it (using the magic word, "Switch"). Miss Fury goes back to the beginning, and kills the man who started everything -- Harmon/Hermann. Then she destroys the time machine so it can never be used. This should put everything right with the world. But, clearly it doesn't -- because when she uses the time-travel sphere that Schauberger gave her earlier, and goes back one more year to 1942, to the platform where she said good-bye to Chandler, he's not there (and neither is her old self, though she doesn't seem to notice that part). Additionally, Schauberger's dead soul is still time traveling (as is clear from his observation of her at in the last panel) -- that should not be possible, since he did not start time traveling until Miss Fury entered the machine that she has now destroyed. Writer Rob Williams has done a fairly good job with the time travel and the paradoxes so far, but he still has some explaining to do in future issues. We still don't know exactly what events have remained in the timeline, and what events Miss Fury's murder of Harmon erased. Additionally, how Chandler could not be there in 1942, when Fury only changed events post-1943, is completely unclear at this point. More explanation is clearly needed. That said, Williams did a great job of wrapping up most of the loose ends from the earlier books, and he does an outstanding job of Miss Fury's characterization. I don't really know anything about the prior incarnations of this character, but we see in this issue a good reason for what I assume will be a "code against killing" in future issues -- she has been forced to kill several times in this first arc, and she has had enough of it. She swears never to kill again. We will have to see if she can stick to her vow. Once again the art in this issue is excellent. The action scenes, backgrounds, and special effects all look great. The evil grins on the faces of the two main Nazis - Hermann and Schauberger -- are priceless. Nazis always make great villains but artist Jack Herbert really brings their malevolence to life in these pages. And as always, he draws a beautiful Marla/Miss Fury -- tough as nails, yet still vulnerable. Overall this was a good issue, with a solid story and lovely art. Of the first five issues, I have liked this the best so far. I am definitely going to stick around for a while and see how this series develops.